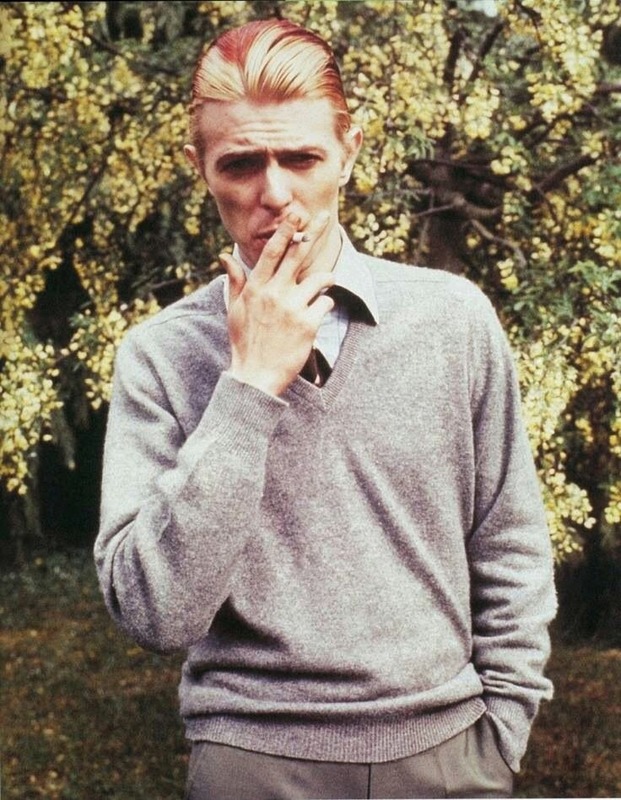 Katie Puckrik Smells: Fumes in the News: What Does David Bowie Smell Like? Fumes in the News: What Does David Bowie Smell Like? David Bowie is described as “the best-smelling human I ever met”, by Arcade Fire musician Will Butler. The Thin White Duke's fumes came up in Butler's conversation with BBC 6 Music's morning goddess Lauren Laverne last week while promoting his debut solo album Policy. It smelled like if an ancient pine forest had a massive forest fire -- but like, a month ago. So you get the new growth of the grass and the moisture, but still there's an undercurrent of pain. But also of smoke, so kind of like marshmallows...? It's powerful. So what was David Bowie wearing? To me, “smoky, month-old pine forest fire” says Annick Goutal Encens Flamboyante loud and clear. But that misses out on the grass, moisture...and marshmallows. Let's put our noses together, people, and figure this out. To get us started, let's flash back to Ziggy-era Bowie. 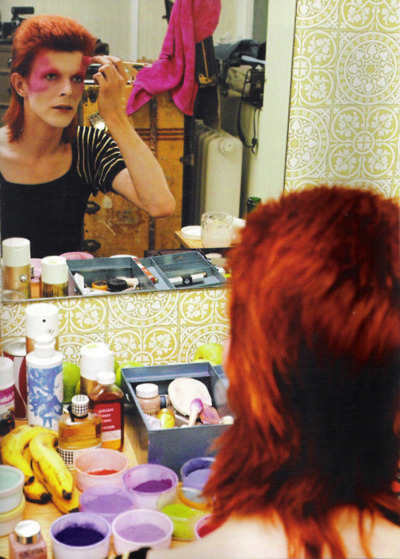 In this 1973 Mick Rock photo, there's a tantalizing glimpse of a Dior bottle nestled next to the bananas on David's backstage dressing table. Both Diorissimo and Miss Dior came in the black and white houndstooth splash bottle with its jaunty bow tie. I'm sure Ziggy Stardust would have made an appropriate conveyance system for either. 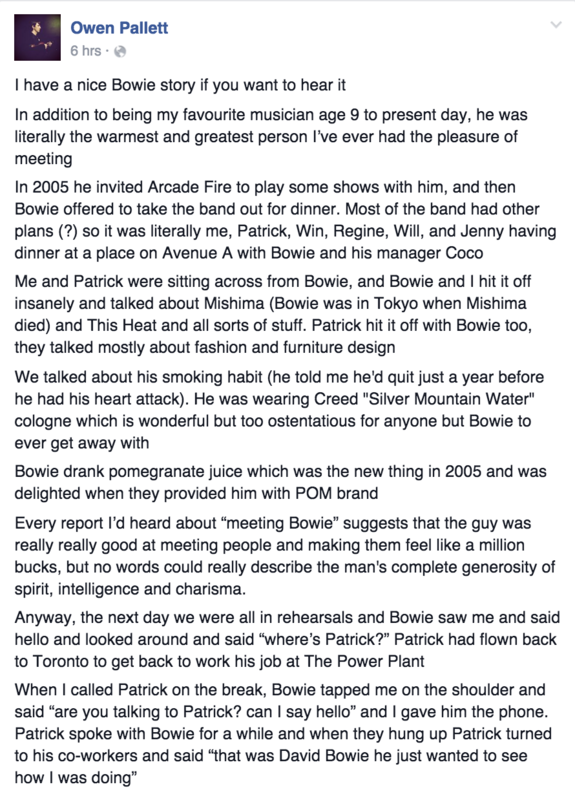 In 2005 he invited Arcade Fire to play some shows with him, and Bowie offered to take the band out for dinner. Most of the band had other plans (? ), so it was literally me, Patrick, Win, Regine, Will and Jenny having dinner at a place on Avenue A with Bowie and his manager Coco. Me and Patrick were sitting across from Bowie, and Bowie and I hit it off insanely and talked about Mishima...and This Heat and all sorts of stuff. Patrick hit it off with Bowie too, they talked mostly about fashion and furniture design. We talked abut his smoking habit (he told me he'd quit a year before he had his heart attack). He was wearing Creed Silver Mountain Water cologne which is wonderful but too ostentatious for anyone but Bowie to ever get away with. This new world without David Bowie in it feels a little less special. Read Pallett's full post here. My first thought was that it sounds like Ormonde Woman. It has that grassy, pine forest with darkness (pain?) as weel as spun sugar. Not sure it smells like it burnt down though. Then I thought perhaps Bois d'Encens by Armani. It has that smokey forest vibe but no marshmallows. Finally I'm wondering if it could be Fille En Aiguilles by Serge Lutens. It's a slightly smokey pine forest with a little sweetness, though that's more fruity than marshmallow-y. Dying to know what it is. Looking forward to others' thoughts. Hi Tara! Hey, those are good thoughts! I take your Ormonde Woman and raise you Ormonde Man. That's even more piney. Now I have an idea that Tauer L'Air du Desert Marocain could fit the bill. It's smoky, with a cola sweetness. I dig ya, Tai - the idea that you could make yourself smell just like your favorite and most-cherished cultural god or goddess is heady stuff! Dense, grassy and smoky, that one, while still being light on its feet. A solid contender. Yong, how do you know? You sound pretty definitive! Thanks. According to his official web-site, Minotaure by Paloma Picasso, which he says, "is hard to find, so he stocks up. He also like anything by Guerlain." Hmm. Interesting. I think someone who wasnt familiar with vetiver might describe it that way, so Sycomore fits. I'm unfamiliar with Minotaur. Yeah! I'm intrigued by how Will Butler (presumably not a self-identifying fumehead) just plunged in to paint a word picture of the fragrance. A fine imagination at work. It's Zino by Davidoff! Well, in 1988 it was. Possibly Sycomore, Timbuktu, Rien, CDG 2 Men, or good old Vetiver Guerlain? I love the description, Cybele - and your suggestions! Guerlain Vetiver has been my winter comfort scent. I'm also thrown by the marshmallow, Brooke. I'm wondering if Will said it as a result of an association with smoke and campfires, rather than the literal smell of burning marshmallows. If so, your suggestions are fine ones. And the Amber Fetiche even gets a tad actual marshmallow-y with its sweet vanilla-ness. It's an ongoing forensic study. I immediately thought of Bois d'Ascese when I read that description, but given how recent this perfume is, it will depend on when exactly Butler smelled Bowie. Also Arso came to mind, but we've got the same problem. I know Bowie and Arcade Fire worked together in the last couple of years, so it is possible that the Naomi Goodsir perfume could be a contender. Yeah, layering would allow for any number of "perfume math" combinations to get to the beautiful fug that Will Butler reported. Ooh, good Bowie sightings (and smellings), Richard! His name is not "Will" Butler, it is *Win Butler as in Edwin. I agree that it sounds like ELdO's Divin Enfant or a layered combination. Will Butler is the brother of Win Butler. Naw, the Butler here in question is Will - check the links, yo. Win's bro has a side project going, and was a very entertaining interviewee on Lauren Laverne's 6 Music show. It could be Guerlain's Aqua Allegoria Winter Delices. Hmmm, pine-y. I totally see Dave wearing a Lutens. Fille en Aiguilles? Idk if it fits campfire smell. Perhaps it's more of a pine-y incense. Which then, Idk off-hand what it could be. F e A from Lutens is good - it's forest-y and sweet at the same time. Hey Katie ;-) I'm a huge fan of Molecule 01 and I was wondering if as today there's a new buzz similar to this fragrance, you know since 2006, I also wear Joe Malone's Lime Basil & Mandarin. Thanks! Dan, Molecule 01 continues to dominate the world of perfume. I don't have facts and figures, but I do know from chatting to the fume jockeys at Liberty London and Scent Bar that it's their best-selling fragrance. Nothing released since has come close in popularity and in capturing the public's imagination, both conceptually and how it smells. Highly unlikely and obscure, but it does sound quite a bit like Phonecia's Far NWest. It has the wet and dry woods and the roasted marshmallows. Only a bit smoky, though, and with a lot of skunk (yes, really). I love the description. Surely someone reading this knows Mr Bowie well enough to ask??? Ablaze by Boadicea sounds kind of like this. R.I.P., Bowie. Now I'll never get to smell you, alas! It is just so sad to say goodbye to David Bowie. I can't really get my head around it. "Marshmallows" sounds a bit abstract, as though a smoky smell might be reminiscent of roasting marshmallows. If he literally got the impression of marshmallows, maybe Bowie was layering a gourmand with a green fragrance? I suspect an overall smoky smell that alluded to marshmallows, rather than a full-on blast of Pink Sugar. Perhaps his fragrance was mixed with cigarette? The Naomi Goodsir also comes to mind. It seems Bowie had packed in the smoking by the time we was working with Arcade Fire. Your suggestions are really creative! That's a good, mellow one. Sans marshmallows, it sounds like Norne by Slumberhouse. I need to check out this Portland OR line. Portland is one of the best cities I've every visited. I'd love to read the article. Do you remember where you saw it? Over the last couple of years I have bought my husband samples based on this list (and some other casual internet research). He's a Bowie fan and it's been a lot of fun having him smelling like Bowie. His favourites so far are Minotaure and Guerlain's Vetiver. Smelling and wearing them has been a nice way of remembering and paying tribute this week. Thanks to all for the suggestions. Ooh, I didn't know Vetiver was in Bowie's rotation! I've been having a love affair with that one for the past year. Not sure the interview, but Bowie said in the 70s he and someone were always experimenting with layering scents. I would love to track down that interview! I wonder if the "someone" was Brian Eno, who is known for being a fumehead. Yes I was thinking this - he surely would have done some nasal jazzin' with Mr E.
Might he have had a personal Guerlain or whathaveyou composed? I would, in his shooz. He must have dallied with most of the Guerlains, of all genders. This is an important mission, on which we must find some concrete data! I just love old pictures/glimpses in film of dressing tables & perfume collections, over which I like to pause & obsess. I think Ziggy would have gone with Diorella - also a houndstooth. I love to think of Ziggy in a cloud of Diorella. If only because that used to be one of my go-to's. Michele, I'll bet someone with Bowie's appreciation for complexity and jarring contrasts got a kick out of A*Men. Chameleon that he was, he probably had a whole wardrobe of smells - for all his looks, moods and modes. Thanks, Tspora! Those are both lovely smells. I wear Habit Rouge from time to time. "Bowie offered to take the band out for dinner. Most of the band had other plans..."
WHAT IN THE NAME OF GOD?! I could literally be scheduled for major surgery, childbirth or my own wedding, and I would still get a rain check and bail in order to accept a dinner invitation from DAVID BOWIE. Oh my god. Who ARE these people.